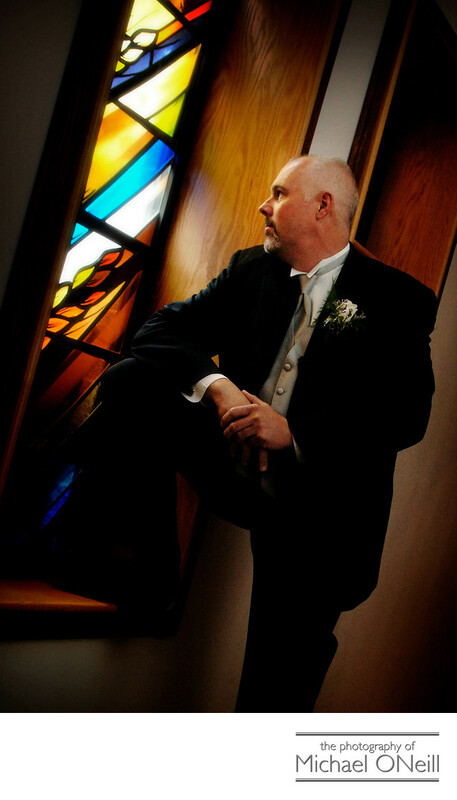 This portrait of the groom was taken in church just prior to the start of the wedding ceremony. In just a few minutes his bride would be walking down the aisle and he would see her in her wedding dress for the first time. I loved the way the natural light was streaming through the stained glass windows of this beautiful church...perfect light for this powerful image of the groom. After church we would head right over to their reception venue, the deSeversky Mansion at New York Institute of Technology (NYIT) for photos in and around that magnificent venue. I love taking wedding pictures at the deSeversky mansion...truly one of the finest catering facilities in Nassau County, Long Island. If you are planning a deSeversky wedding you owe it to yourself to come visit me at my East Northport, New York wedding photography studio. I would love to discuss your plans for the big day with you and would consider it a privilege to be a part of your celebration.